24 individually foil wrapped wipes per box/12 boxes per case. Suited for cleaning all non-porous surfaces of the telephone. The bacteriostatic properties in the wipe instantly sanitize the telephone's surface, thereby eliminating the spread of germs . 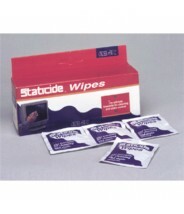 Keep Equipment Clean & Static Free!